When GitHub met Microsoft: Good for enterprise DevOps? As the news of Microsoft's $7.5 billion acquisition of GitHub went from rumor to reality this week, the buzz in the developer and DevOps communities hit a crescendo. Among developers and DevOps practitioners on the ground, reactions to the deal ran the gamut from cautious optimism to the first stages of grief. That was evident as a storm of meme-laden social media activity broke out. Many poked fun at the bad rep that Microsoft hasn't been able to shake for past transgressions against the open-source community. Front and center in the cynical groundswell is the #movetogitlab Twitter storm, one that the folks at GitLab played up to boost the number of migrations to their platform. GitLab claims that it saw a tenfold increase in imports from GitHub over the last week, with its counter showing a peak of over 20,000 projects imported per hour on the day of the announcement. Despite the mixed reactions generally, this move could be good news for DevOps teams—with a few caveats. Turning over a new leaf at Microsoft? Even amid the furor, many in the DevOps world have stepped up with balancing perspectives on what this acquisition might mean for GitHub users' daily work in the future. Many believe it bodes well both for the health of GitHub and the impact on DevOps. They say this is further evidence that Microsoft is turning over a new leaf, rather than an ominous sign that it plans to lay waste to the open-source community that GitHub built up. Clay Smith, developer advocate for software analytics firm New Relic, said he was liking what he saw. "My gut reaction was this is still more evidence that this is a new Microsoft." Three years ago, Smith didn't use any Microsoft tools for development—and he didn't know any cloud-native or startup developers who did. "Now I'm using Visual Studio Code daily to write code and push it to GitHub," he said. "Microsoft is now deeply embedded in my development workflow, and that says a lot, since I hadn't used Windows for nearly a decade and I am a longtime, happy AWS user." Anxious DevOps pros thinking of jumping ship should keep things in perspective, says Adam Mansfield, the Microsoft practice leader for IT consulting firm UpperEdge. The hard truth, he says, is that for its long-term success, GitHub needed a big influx of cash to counteract the profitless cash burn it's been going through as it has scaled up in recent years. Without a deal of this magnitude, it would have had to eventually shut its doors anyway. 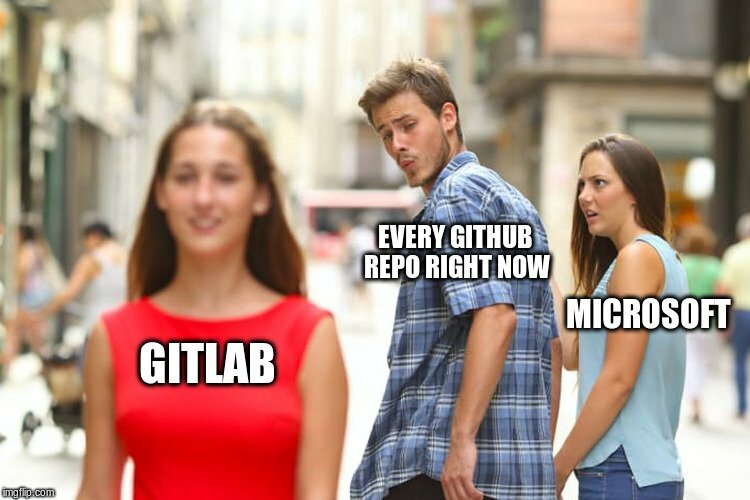 "It is true that many developers have already jumped ship to rival GitLab, but I wouldn’t be surprised to see them jump back after the initial level of anxiety goes away and Microsoft’s actions show how committed they are to open source." One driver of the backlash is that developers have a long memory, and many are still processing the cultural change at Microsoft toward a cloud-centric, DevOps-friendly model, says Matt Stratton, DevOps evangelist at incident response firm PagerDuty. "Folks still remember 'embrace, extend, extinguish,' regardless of the intent of current Microsoft leadership. I have no reason to doubt they are genuine with this, [but] the company has a lot of trust to win back with the open community." For its part, Microsoft has gone out of its way to quell fears that it will tamper with GitHub's magic. Microsoft CEO Satya Nadella reiterated that the company is "all-in on open source" and will keep GitHub an open platform. While the jury is still out on how true the company will remain to that promise, many believe this is Microsoft's defining opportunity to truly gain developer community trust. "How the GitHub acquisition is handled can repair a lot of that mistrust, or cause more backlash. It all depends on how Microsoft treats the existing functionality and community." Based on the direction Nadella is taking Microsoft, the company has an economic interest to serve the DevOps community by keeping GitHub and its community healthy. Adrian Lane, industry analyst for security research firm Securosis and vice president of development for cloud security automation vendor DisruptOPS, said tht cloud services and DevOps bring a whole new world of software-defined everything to Microsoft’s doorstep, and that they are embracing that. "Most dev teams use continuous integration, and many are moving to DevOps, which means their applications, software-defined infrastructure, and orchestration code reside in GitHub. So it’s a very important hub for dev and IT," Lane says. "Making developers happy is important to Microsoft’s business-cloud business—an area where they presently trail AWS—and keeping GitHub healthy is a way to help in this area." Industry watchers agree that those working on enterprise DevOps transformations stand the most to gain from the Microsoft ownership of GitHub. Tal Weiss, co-founder and chief technology officer at software analytics firm OverOps, said: "GitHub is at the center of the developer community, but as a business, they have faced challenges in reaching the enterprise buyer—something Microsoft is extremely well-versed in." "Assuming it’s kept a separate entity and is not beholden exclusively to Azure, this acquisition gives GitHub the opportunity to deliver the features enterprise DevOps and development teams need." And even if Microsoft doesn't make any immediate changes to the platform, simply adding its stamp of approval to GitHub will open up doors within enterprises that crave stability from their tool makers, he adds. "I wouldn't be surprised if we start to see corporate firewalls allowing access to GitHub, now that it's a Microsoft-owned property, and perhaps considered enterprise-ready," says Stratton. "Microsoft knows how to make products that make enterprise architects feel confident, so their blessing and ownership of GitHub could encourage social coding within enterprise organizations." Ultimately, the deal will probably result in Microsoft bolstering and streamlining GitHub's enterprise offerings with Microsoft intellectual property, rather than the other way around, says David Colebatch, a veteran developer and CEO of cloud migration tool vendor Tidal Migrations. He and others point to the internal use of GitHub at Microsoft as a good sign in that regard. Colebatch said that in the long term, he suspects that Microsoft will fold the best pieces of its competing products, like Visual Studio Team Services, into GitHub, simplifying the management of enterprise software projects, which he said tends to be fragmented in our enterprise customer base. "The fact that Microsoft already makes extensive use of GitHub internally means this could happen sooner rather than later, and will be a net gain for those of us who stay with GitHub as we get more features around continuous integration and delivery and cloud included for free as an incentive to stay," Colebatch said. As Colebatch explains, the danger that Microsoft will do this at the cost of shutting out other cloud solutions is low, simply due to DevOps' market dynamics. "While some suspect Microsoft will use the GitHub acquisition to shut out the other cloud vendors by limiting DevOps toolchain integrations to those that only support Azure, I do not believe this will happen with the new, inclusive Microsoft. Multi-cloud is what customers demand." Nevertheless, there are still many within the DevOps and the free and open-source (FOSS) communities who on general principal don't like the kind of consolidation that this acquisition signals. Even among that group, however, some believe that this deal could have a net positive effect—because it serves as a wake-up call for many organizations to diversify their tool chains so as not to rely on any one tool vendor for a given function. But even though it was built around Git's decentralized platform, GitHub grew into a centralized community that holds a ton of influence over the DevOps and FOSS communities, says Jeremy Steinert, chief technology officer at WSM International, a DevOps services firm. " Steinert said that centralization around any one platform was not good for the DevOps and open source communities. This consolidation could result in a more decentralized approach to both software development and DevOps integration, which will hopefully drive more innovation." "My hope is that—one way or another—this leads to greater competition, more innovation, and less reliance on any one single platform."